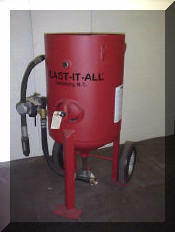 Each abrasive blasting system features efficient piping designed to provide low pressure drop. For each drop in pressure of just 1 psi at the blast nozzle, a blasting system loses 1 1/2% in productivity, so minimizing pressure drop is important. The systems are low maintenance for reduced downtime. They’re designed with a low profile for easier filling and ample wheel clearance for greater stability when the system is in use.